« USA Today and Stuck on You Releases! 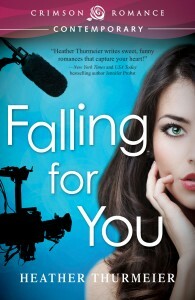 FALLING FOR YOU is now on a book tour with Tasty Book Reviews. And to say thanks to all my faithful readers, I’m giving away a $20 Amazon Gift Card!!! All you have to do is come on tour with me and leave a comment at any/all of my tour stops for your chance to win! Simple!! So far, reviews for FALLING FOR YOU are amazing!! So what are you waiting for? Find out if the reviewers are right and check out FALLING FOR YOU for yourself! And don’t forget to stop by my tour for your chance to win a gift card! Thanks for the giveaway! I’ve seen this book around on various blogs and it looks so good! I really enjoy contemporary romance. Heather — this sounds like fun — thanks for the chance to win. I love humorous sweet contemporary (which is also what I write). Good luck with the tour! Congratulations on the new book! I love romance. Thanks for the giveaway. Hope this is one of your blog tour stops 🙂 Love the cover of the book! Happy Hopping and congratulations, sounds like you have a winning series.